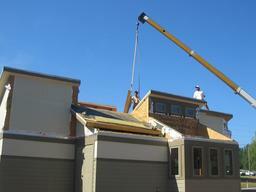 Thermocore of Missouri installed the structure of the 2007 Solar House in just 2 days. They started Monday, February 26th with a little trouble from the boom truck. It got stuck in the mud and we were not able to start until about 10:30am. After that, we had trouble getting the SIP panels off the trailer, they are heavy and the boom truck is… well… old. 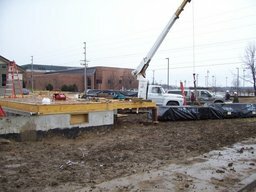 Once we finally got the SIPs off the trailer there was only one more hang up, the boom truck was not tall enough to lift a long stud above the north wal. Tuesday was an even more interesting day… school was cancelled because of a bomb threat, so we had a lot more students able to come out and work on the house. The entire structure was completed around 1pm. That night a few students stayed around till 9pm to wrap the house for a little weather resistance. This is around 11am, just after we got the boom truck out of the mud. 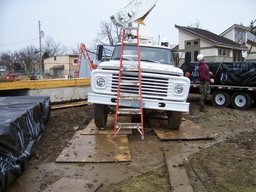 Here is the boom truck tipping because it can’t lift the SIPs off the trailer. 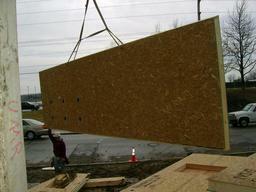 Here is a large wall being moved into place on the subfloor. Check out all the blue boxes on that wall. Thats for the home automation. This is the progress of the house after day 1. This is the last panel! The structure is done! I really like this design. 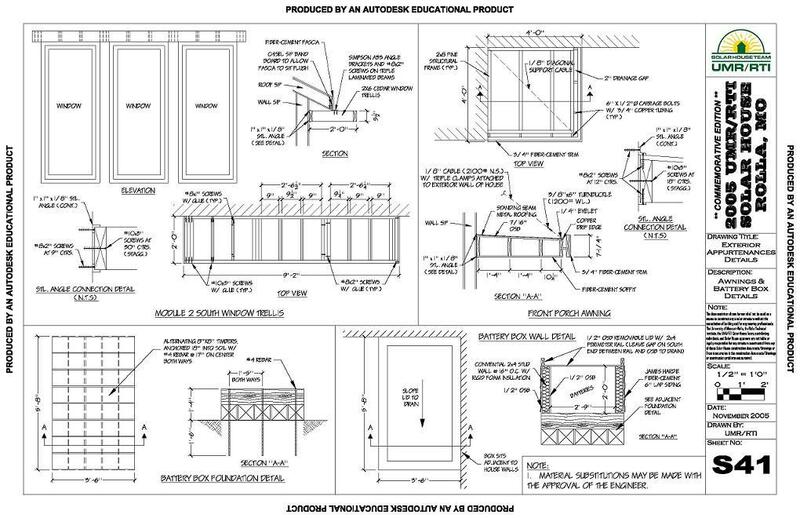 Here is a view of the space where the operable glass wall will stand. 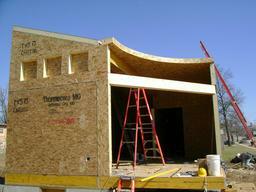 It will follow the curve of the roof. 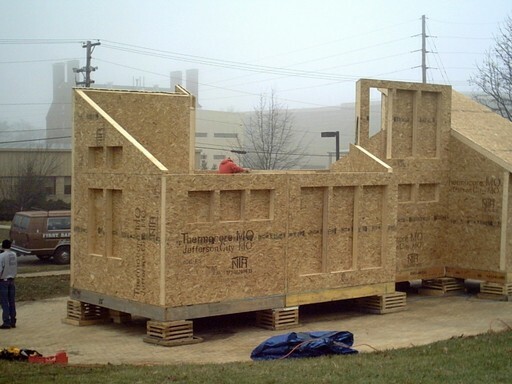 Is the solar house team going to put up some webcams up in the solar village? At the moment we do not have the internet infrastructure in the solar village to install a webcam. We would like to get one up so you can see our progress, but in the mean time I will be posting pictures often. 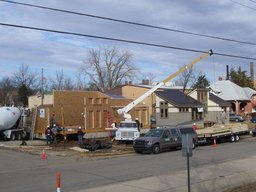 The walls and roof of the 2007 Solar House will be installed Monday, February 26th and Tuesday, February 27th. 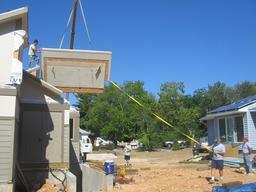 Thermocore of Missouri will be at the Solar Village raising the roof. Come on by and see the third installment in the UMR Solar Village. The following pictures are from the 2005 installment. If you would like to make a donation and recieve a free plan set, email sunhome@umr.edu or call our office at 573-341-6794.